A sensitive probe to monitor hydroxyl radicals in water has been developed by a team of Swiss and US scientists. Hydroxyl radicals are high-energy oxidants that are important in the biology of ageing and radiation damage, as well as in environmental chemistry. In natural water systems, the radicals are produced photochemically from nutrients such as nitrates or nitrites and pollutants such as dissolved organic matter. And accurately measuring hydroxyl radical concentrations can help understand the fate of pollutants. Current hydroxyl radical probes, such as benzoic acid, often have limited sensitivity, require long irradiation times or high concentrations of the probe, which can affect the sample. 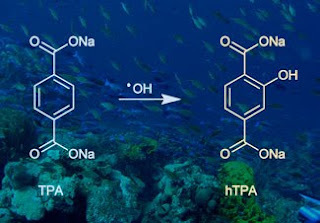 Now Kristopher McNeill at the Swiss Federal Institute of Technology (ETH) in Zurich and colleagues at the University of Minnesota in Minneapolis have discovered that terephthalate is a more sensitive probe for hydroxyl radicals in aquatic environments. Terephthalate is used as a probe molecule in biology and radiation research, but McNeill is the first to use it in aquatic chemistry. It reacts with hydroxyl radicals to produce hydroxyterephthalate - a fluorescent molecule that is easily detected. 'The system can detect about 10 times less hydroxyl radical than the comparable method that uses benzoic acid as a probe. 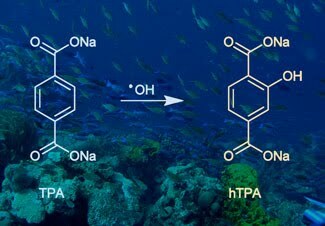 This may be important in marine systems or other systems in which hydroxyl radical concentrations are low,' comments Matthew Tarr, an expert in environmental chemistry at the University of New Orleans in the US. However, McNeill and colleagues did find some limitations in using this probe as hydroxyterephthalate degrades on exposure to UV radiation. 'Consequently, the system cannot readily be used to study systems exposed to natural sunlight or full spectrum simulated sunlight,' adds Tarr. 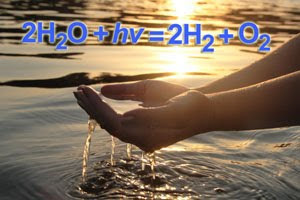 'One of the unsolved mysteries of aquatic photochemistry is what all of the sources of hydroxyl radicals are and what their relative importances are,' says McNeill. The team now plans to use the probe to study different components of aquatic systems, particularly organic matter, to assess each one's ability to generate hydroxyl radicals. Chemists have developed a sensitive new infrared (IR) spectroscopy method that analyses molecular ions by capturing them in nanosized bubbles of freezing helium. By slowing molecular vibration and rotation in this way, the technique can give useful information about important biomolecular ions. IR spectroscopy works by passing a beam of infrared light through a sample and measuring how much energy is absorbed at each wavelength. Chemical bonds vibrate at characteristic frequencies, so specific covalent bonds can easily be identified. At temperatures this close to absolute zero, the molecules are unable to vibrate or rotate. UV light can be used to ionise the molecules - and IR light can excite them to start vibrating again. 'This process gives us greatly simplified and clean spectra, which contains a lot of useful structural information,' Drabbels adds. The team tried the approach to record IR spectra of aniline ions, and found the method to be more sensitive by almost two orders of magnitude compared to other techniques used. But although the technique is simple, it may not be straightforward to commercialise, Drabbels notes. One challenge is that the nozzle used to create the helium droplets is so small - only around 5um - that it can be blocked by a single dust particle, meaning that an especially clean gas supply and lines are needed. As well as studying the ionic forms of important biomolecules, larger clusters or aggregates might also be studied with this method. Interestingly, since the experiment cools molecules down to temperatures where superconductivity can be observed, the team hope that this process will give new insights into the phenomenon. 'This is a remarkable experimental result that opens up a new approach to the spectroscopy of complex molecules,' says Kevin Lehmann, a spectroscopy expert at the University of Virginia. A polymer that changes shape in response to a variety of temperatures could be used in a wide range of applications from temperature sensors to weather-responsive public art scientists claim. Mather made the polymers by treating a commercially available liquid photopolymer with UV light while carefully controlling the temperature - a process known as curing. As it cures, a photo-crosslinking reaction takes place which changes it from a rubbery to glassy state at the surrounding temperature. The material is then placed on a surface with a temperature gradient and cured under UV light again. This time the polymer experiences different temperatures along its length and the temperature at which it changes to a glassy state mimics the temperature gradient on the surface. 'The process should be applicable to other photo-cured glassy shape memory polymers' claims Mather. Indents created in the polymer were monitored using polar optical microscopy. The images disappear on heating, indicating that the polymer recovers its original shape. 'While the first generation of this new family of materials is based on a rather simple temperature gradient, the work beautifully demonstrates the power of the design. It paves the way to the next generation of smarter shape memory polymer objects that can be taught to do tricks that so far have not been possible' explains Christoph Weder an expert in stimuli-responsive polymers at the University of Fribourg, Switzerland. Functionally graded shape memory polymers 'could be used as cheap, passive temperature sensors in packaging to monitor the maximum temperature experienced by packages,' he adds. Eventually the functionally graded shape memory polymers 'could be used to create public art that responds to temperature or the sun,' he suggests. University of Southern Mississippi scientists recently imitated Mother Nature by developing, for the first time, a new, skinny-molecule-based material that resembles cilia, the tiny, hair-like structures through which organisms derive smell, vision, hearing and fluid flow. While the new material isn't exactly like cilia, it responds to thermal, chemical, and electromagnetic stimulation, allowing researchers to control it and opening unlimited possibilities for future use. This finding is published in the September 23 edition of the journal Advanced Functional Materials. The National Science Foundation's Division of Materials Research supports Southern Miss's Materials Research Science and Engineering Center for Response-Driven Polymeric Materials, where the research took place. Cilia are wavy, hair-like structures that extend outward from the surfaces of various organisms such as human skin. People, animals and single-celled organisms use them to sense the environment, gather information about it and adapt to it. 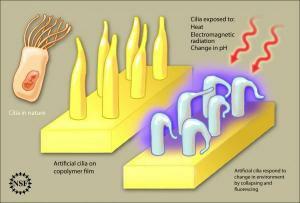 Scientists long imagined what could be done if they could engineer cilia for other organic and nonorganic uses. But creating them solely belonged to the life nurturing processes of nature, until now. Marek Urban, Southern Miss professor of polymer science and engineering, along with a team of researchers, developed a new thin copolymer film with whisker-like formations that mimics Mother Nature. "Our interest is in developing materials with multi-level responses at various length and time scales," said Urban. "I believe this is the future of science and engineering that will drive future technologies." 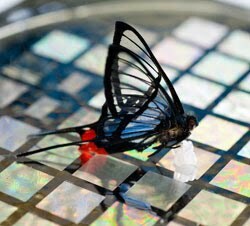 Employing a process used for years to produce latex paints, the researchers formed thin copolymer-based films whose chemical composition makes possible filaments that have built-in molecular sensors that respond to temperature, acidity and ultraviolet radiation. Moreover, the filaments are capable of locomotion, waving, shrinking and expanding in response to stimuli. They also are capable of fluorescence, that is, absorbing and emitting light and changing colors as a reaction to ultraviolet rays. The ability to engineer this cilia-like biosensor may give scientists an ability to, for example, test for the presence of toxins, oxygen or even lack of oxygen in an environment. Future opportunities for sensor use might include developing new sensors for testing glucose levels, using the sensors for drug testing, or testing for air or water safety. There is no limit to dreaming up applications for such a material, said Urban. "Many new ideas are being generated as we speak, but it is too early to reveal them." Immediate next steps will be to team up engineers to make use of the materials. Former Southern Miss graduate students Fang Liu, who now works with Proctor and Gamble, and research associate Dhanya Ramachandran contributed to this research. A research team led by Edward Yu of Iowa State University and the Ames Laboratory has discovered the crystal structures of pumps that remove heavy metal toxins from bacteria, making them resistant to antibiotics. The findings are published in the Sept. 23 issue of the journal Nature. 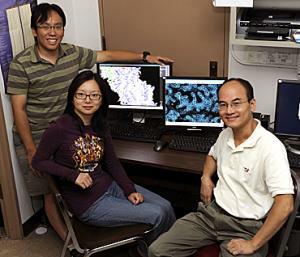 Yu -- an Iowa State associate professor of chemistry, of physics and astronomy, of biochemistry, biophysics and molecular biology and an associate of the U.S. Department of Energy's Ames Laboratory -- said the finding gives researchers a better understanding of bacterial resistance to antibiotics. Ultimately it could help drug researchers develop treatments to combat that resistance. To make their findings, the researchers purified and crystallized the membrane proteins that make up an efflux pump of E. coli bacteria. The researchers prepared some samples that contained the toxic heavy metals copper and silver and some that did not. The researchers used X-ray crystallography to compare the various structures, identify the differences and understand the mechanism that removes heavy-metal toxins from cells. Their paper specifically describes the crystal structure of CusA, one of three parts of the pumps responsible for removing toxins from bacteria. Yu said CusA is an inner membrane transporter which belongs to the resistance-nodulation-division protein superfamily. It consists of 1,047 amino acid residues and spans the inner membrane 12 times. What those pumps do, Yu wrote in a summary of his research, is "recognize and actively export these substances out of bacterial cells, thereby allowing the bugs to survive in extremely toxic conditions." The research project was supported by the National Institutes of Health. In addition to Yu, the research team includes Robert Jernigan, an Iowa State professor of biochemistry, biophysics and molecular biology and director of Iowa State's Laurence H. Baker Center for Bioinformatics and Biological Statistics; Kanagalaghatta Rajashankar, the operations team leader for the Northeastern Collaborative Access Team facility at Argonne National Laboratory in Argonne, Ill., that's managed by Cornell University in Ithaca, N.Y.; Iowa State post-doctoral researchers Feng Long and Chih-Chia Su; and Iowa State graduate students Michael Zimmermann and Scott Boyken. "This work reports the first detailed structure of a unique heavy metal transporter that enables bacteria to survive the toxic effects of silver and copper," said Jean Chin, Ph.D., who oversees this and other structural biology grants at the National Institutes of Health. "By detailing the exact steps that a metal ion is likely to take through the transporter, this study suggests how we might block the pathway and render pathogenic bacteria sensitive to heavy metal toxins." Yu, who has been studying bacterial resistance to antibiotics for nearly a decade, said direct information about how bacteria handle heavy-metal toxins is important information for biomedical researchers. "We want to understand the mechanisms of these heavy-metal pumps," he said. "And that could allow biotechnology researchers to make inhibitors to stop the pump and the antibiotic resistance." Wax. Hydrates. Asphaltenes. Algal growths. 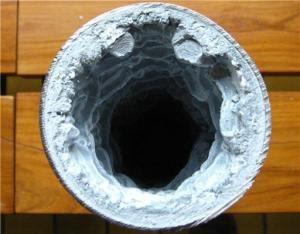 Protein and mineral deposits: Fouling is major industrial problem. Researchers at SINTEF in Norway are testing solutions. •Solids precipitate out from an industrial flow system, accumulate on permanent surfaces and thus obstruct both flow and heat exchange processes. This results in major remedial costs. •Fouling problems often arise in connection with the exchange of heat through a dividing wall. The issue is so complex and far-reaching that fouling has rapidly grown into a distinct multidisciplinary field of study involving economics, physics, chemistry and flow mechanics from the micro to the macro scale. At the Process Technology department at SINTEF Materials and Chemistry, researchers are conducting flow modelling studies in order to investigate both particle transport along pipe walls and the adhesive properties of particles on the walls themselves. It all started with a doctorate degree at the department. In order to come up with solutions, researchers are currently working together with the industry, industrial coating and surface treatment suppliers, and other research institutions. "Fouling can occur both as a result of crystal growth directly on pipe walls, and also when crystals growing within the fluid flow coagulate to form particles that seek to attach themselves to the walls," says Sverre Gullikstad Johnsen. He is carrying out research into the problem and is involved in several projects. SINTEF has many major clients linked to the oil industry, and researchers are working to find solutions that can make the transport of the unprocessed well flow more efficient. One solution under investigation is the application of a coating on the inside of the pipe wall that reduces precipitation on the wall itself, while at the same time protecting against corrosion and reducing friction by effectively making the pipe wall smoother. "Experiments have been carried out to compare untreated with coated steel surfaces," says Johnsen. "The challenge is to isolate the various contributory factors in the precipitation process, where we known that both the surface properties and thermal conductivity of the pipe wall, as well as the properties of the oil, will all play a part." Design tools "in the pipeline"
SINTEF researchers are also working with the Finnish lime industry. This work is part of a larger EU project bringing together research and industry partners from Ireland, Finland and Sweden. Lime is transported through pipelines as a mud, and problems occur when minerals are precipitated on the pipe walls when the mixture is subjected to heat treatment. The researchers have developed a mathematical model which they use to study how the particles move against the fluid flow and seek to attach themselves to the pipe walls. Various interactions between the fluid and the particles are built into the model. The aim is to construct a design tool for processing plants that can be utilised in combination with other commercially available flow simulators. "We will have achieved a great deal if we can demonstrate to the industry when and where fouling will take place," says Sverre Gullikstad Johnsen, who emphasises that his field of study is closely linked with general energy strategies. If we can improve the heat exchangers, their efficiency will increase, and energy consumption will be reduced. Chemists have discovered that small structural differences in oligosaccharide clusters can lead to dramatic differences in the way they interact with the body. They hope their research can have uses in diagnosing diseases such as cancer. Oligosaccharides, also known as glycans, are carbohydrates made of more than four or five sugars linked together. Found throughout the body in the form of glycoproteins and glycolipids, they play an important role in processes such as cell-cell recognition and protein folding. While researchers know that oligosaccharides are important, studying how they mediate specific processes is tricky. To resolve this, Koichi Fukase from Osaka University, Japan, investigated the dynamics of a number of oligosaccharide clusters in vivo. © Angew. Chem. Int. Ed. Fukase and his team synthesised a number of N-glycan clusters - oligosaccharides linked to the amino acid asparagine - and traced their movement in mice via both fluorescent and radioactive labels. Their results showed that small structural differences had a dramatic difference on N-glycan behaviour. The team found that clusters with a sialic acid functionality were stabilised in the body, travelling to the spleen, while the same cluster without the acid was rapidly excreted via the bladder. 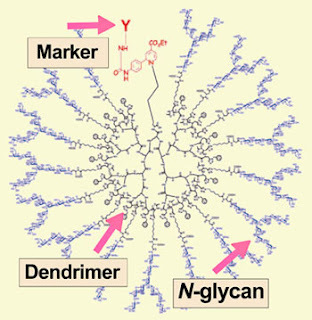 Likewise, changing the position of the sugar-acid linkage also altered the glycan's activity. Linking at the 3' rather than the 6' position on the sugar resulted in the glycan being quickly cleared from the body. The team also found that the oligosaccharides behaved differently in cancer models and normal mice models. The oligosaccharide which did not contain any acid, for example, was significantly stabilised and stayed longer in the body when tumours were present. They hope this difference in activity could be applied in new diagnostics. Geert-Jan Boons at the Complex Carbohydrate Research Center at the University of Georgia, US, says the team's observations are surprising. 'In the long run this could have important implications for our understanding of what carbohydrates do and how this could perhaps be exploited in drug delivery or drug development,' he says. The team is now investigating the mechanism behind these dynamics. 'We don't know the reason for [this behaviour] yet. This is our next target,' says Fukase. End of the road for Avandia? We might finally be getting some closure on the Avandia (rosiglitazone) saga: the European Medicines Agency (EMA) has decided the troubled diabetes drug should be pulled from the market while the US Food and Drug Administration (FDA) has said it will 'significantly restrict' its use. Avandia was once a blockbuster for UK pharma giant GlaxoSmithKline (GSK), achieving global sales of £1.6 billion in 2006. But concerns over cardiac side effects have caused sales to slide dramatically. In 2009 the drug made just £771 million. The decline in sales means that these decisions will not hit GSK as hard as they would have done a few years ago, something analysts have said consistently in the run up to these announcements. But sales of £771 million are nothing to sniff at. 'The suspension of sales in Europe and the limiting of availability in the US still represent a significant loss for GSK,' says Christine Henry, healthcare analyst at market research company Datamonitor. She says that some patients will switch to Actos (pioglitazone), marketed by Takeda, which is in the same class of compounds. But the chances of Takeda profiting significantly from such a shift are low. Actos will come off patent in 2011 and in any case has safety concerns of its own, recently coming under review at the FDA due to a suspected bladder cancer link. 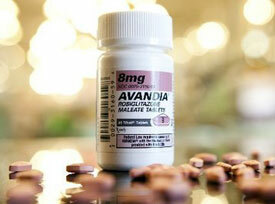 GSK says that it 'continues to believe that Avandia is an important treatment for patients with type 2 diabetes'. But it expects global sales to drop to £100-150 million for the second half of 2010, with 'minimal annual sales thereafter'. The FDA is restricting use to patients with Type 2 diabetes who cannot use other drugs. This follows a July recommendation from an FDA advisory committee to keep the drug on the market. The EMA says that doctors should stop prescribing Avandia. 'Clinicians should review all patients currently on rosiglitazone and take appropriate action, according to the individual clinical situation, to change to another suitable treatment,' said Kent Woods, chief executive of the UK Medicines and Healthcare Products Regulatory Agency. Chemists in the US have developed a new catalyst that could help in a key reaction used to generate hydrogen for fuel cells. The so-called water-gas shift (WGS) reaction is often used in industry to help purify the hydrogen that is generated as a by-product in the reforming of natural gas. In the reaction, residual carbon monoxide in the hydrogen is combined with steam in the presence of a catalyst to produce hydrogen and carbon dioxide. The process purifies the hydrogen gas to a level where it can be used in fuel cells. However, none of the catalysts currently used in the WGS reaction are ideal. Copper-based catalysts essentially do the job, but copper can spontaneously ignite in air - a dangerous property given that air is often used in fuel-cell operation. One touted alternative has been platinum, yet on its own this element is prohibitively expensive. To stand any chance of commercial viability it must be prepared in tiny particles supported by the rare-earth oxide ceria. Unfortunately, ceria is only found in a few places around the world - places, according to Manos Mavrikakis of the University of Madison, Wisconsin, that may become restricted for geopolitical reasons. It is with this in mind that Mavrikakis, together with Maria Flytzani-Stephanopoulos and colleagues of Tufts University and Harvard University, Massachusetts, have been investigating other ways to make platinum viable as a WGS reaction catalyst. By chance, they discovered that alkali metal ions like sodium or potassium can activate fine platinum particles when they are adsorbed on alumina or silica. When they examined the structure, they found extra active oxygen species that seemed to help the platinum complete the reaction cycle. Indeed, the researchers found that this type of catalyst works just as well in the WGS reaction as platinum on ceria, even at relatively low temperatures of 100°C. Yet they are not exactly sure how it works, because there is no experimental way to 'watch' the atoms in action. An 'organic' aqua regia which can selectively dissolve noble metals in solution has been discovered by researchers in the US. The finding could lead to new approaches to recycle noble metals such as gold and platinum from industrial processes and aid the manufacture of nanomaterials, says the team. Traditional aqua regia is a mixture of concentrated nitric and hydrochloric acids in a ratio of 1:3 that can dissolve noble metals such as gold, platinum and palladium, even though the metals are not soluble in either acid alone. However, such inorganic acid compounds cannot be tuned to dissolve one noble metal and not another, making recycling noble metals with inorganic acids a challenge. Now, Wei Lin and colleagues at the Georgia Institute of Technology in Atlanta, US, have demonstrated for the first time an organic solvent which achieves high dissolution rates of noble metals under mild conditions, with the added benefit of being tunable to a specific metal. The team serendipitously discovered that gold dissolves when it is left in a mixture of thionyl chloride (SOCl2) and the organic solvent pyridine. Further experiments on the system revealed that other organic solvents and reagents - such as N,N-dimethylformamide (DMF), imidazole, and pyrazine - could achieve similar effects when mixed with thionyl chloride, with the gold recoverable by subsequent calcination. 'Varying the recipe and reaction conditions even allows the selective dissolution of noble metals,' says Lin. For instance, a SOCl2/DMF mixture dissolves gold but not palladium or platinum. 'The selectivity may be beneficial in improving the purity of the recycled noble metals from catalysis and the electronics industry,' Lin suggests. 'The spectacular dissolution selectivity relies on the intrinsic versatility of organic chemistry so that soon selective organic aqua regia mixtures will be used to dissolve the noble metal of interest,' says Mario Pagliaro a chemist at Italy's National Research Council (CNR). 'One immediate application will be full recovery of platinum from exhaust catalytic converters today, and from fuel cells tomorrow,' he suggests. However, in terms of efficiency and cost, Lin concedes that his organic aqua regia is currently unable to compete with traditional aqua regia. But it does offer a safer alternative and it could have uses beyond recycling, such as synthesis of noble metal nanostuctures and selective removal of nanocoatings. 'It is still far from practical applications yet,' he admits. The team is now working to further understand the chemistry of the dissolution process. 'There are a lot more interesting phenomena that we haven't published yet about organic aqua regia,' Lin adds. US researchers have explained the chemical trick behind Salmonella bacteria's ability to outgrow other microbes living in the gut. The findings could lead to new drug treatments for the bacterial infection. 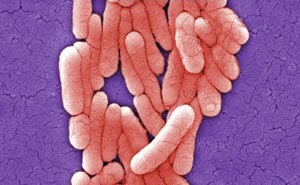 Salmonella is a pathogen which causes severe inflammation and diarrhoea - also known as gastroenteritis. During inflammation the bacteria experiences a population surge, outgrowing other intestinal microbes. Researchers have previously been unable to explain this phenomenon, but Andreas Bäumler from the University of California, Davis, believes he has found the answer. 'We were interested in the mechanisms that Salmonella can use to outgrow other microbes,' says Bäumler, 'and one of the things that has been used traditionally for enriching Salmonella is tetrathionate'. Tetrathionate encourages growth, as Salmonella is able to use it as an electron acceptor for respiration. However researchers believed this mechanism was not important in vivo, as there are no natural sources of tetrathionate. Bäumler and his team found this in fact was not the case. Using high performance liquid chromatography and mass spectrometry they detected tetrathionate in the intestines of animals infected with Salmonella. Normally, microbes in the gut produce toxic hydrogen sulphide, which the body converts to harmless thiosulphate. When Salmonella infects the body, it causes inflammation and triggers the release of neutrophils, cells which destroy bacteria by releasing oxygen radicals. but as well as killing bacteria, these radicals also oxidise thiosulphate to tetrathionate. To test the theory, the team co-infected mice and cattle with a 1:1 ratio of wild type Salmonella, and a mutant strain, which was unable to use tetrathionate for respiration. After four days they found the wild type Salmonella was present in much higher numbers than the mutant strain. Bäumler hopes the research could lead to new treatments against the bacteria. 'You could reduce the sulfur compound in the intestine to shorten the duration of the disease,' he says. International measures fighting ozone depletion are working, according to the latest scientific assessment, but could elevate the climate change threat without continued effort. Atmospheric levels of nearly all ozone depleting substances (ODSs) originally controlled by the Montreal Protocol - the international agreement adopted in 1987 to battle the ozone hole - are declining. But the Montreal Protocol's Scientific Assessment Panel (SAP) emphasises that substitutes for ODSs, such as hydrochlorofluorocarbons (HCFCs) and hydrofluorocarbons (HFCs), are also greenhouse gases. SAP co-chair and director of chemical sciences at the US National Oceanic and Atmospheric Administration (NOAA) A.R. Ravishankara told Chemistry World that so far the Montreal Protocol has dramatically cut greenhouse gas emissions. Its ODS controls have made an impact around five times that of the Kyoto Protocol's first commitment period target, the SAP underlines. 'On the other hand, if HFC emissions continue to grow for the next 40 years, then they would indeed contribute significantly to climate change,' says Ravishankara. 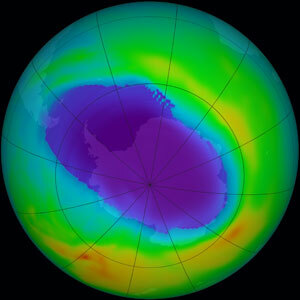 Phasing out ODSs has helped the ozone layer, but could alternatives affect the climate? Nanowires that efficiently split water into oxygen and hydrogen could be an important step toward affordable chemical storage of solar power according to US scientists. Water and sunlight are highly abundant and nature uses these to make energy through photosynthesis. Despite intensive studies on artificial photolysis, making it as efficient as nature is proving difficult. Titanium dioxide electrodes are one way to split water under ultraviolet light but the efficiency is low as they are only able to absorb ultraviolet light and the amount of light converted to energy is low. Now, Hongkun Park and colleagues, at Harvard University, have synthesised TiO2 nanowires with high surface areas, deposited them on an electrode and found that chemically crosslinking them increases their optical density - allowing more light to be absorbed. This allows the light to energy conversion to be doubled compared to previous TiO2 electrodes, says Park. Doping the nanowire network with gold or silver nanoparticles allows the water splitting reaction to take place under visible light, adds Park. This could lead to a ten fold improvement in the catalysts ability to split water, he says. 'Our work shows that the performance of a material can be enhanced by putting it in a nanostructured network, and this design can potentially be extended to many other materials to achieve the goal of highly efficient solar water-splitting,' says Park. The group now plan to study water photoelectrolysis with other metal oxides, such as iron oxide, that can absorb visible light and to study how their efficiency is enhanced in a similar nanowire networks. US researchers have imitated the transport functions of biological membranes by incorporating tiny pumps into synthetic membranes. They say their 'self-pumping' mimics could be used in compartment-less fuel cells. 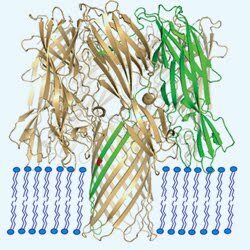 In nature, the membranes that hold cells together contain channel proteins responsible for letting ions in and out. Some specialist channel proteins use adenosine triphosphate (ATP) - the main source of chemical energy in cells - to drive ions against the concentration gradient. Henry Hess at Columbia University in New York and In-Kook Jun at the University of Florida have now designed a polycarbonate membrane with a built-in pump action that's driven, like in nature, by chemical energy. Their synthetic version gets its energy not from ATP but from hydrogen peroxide. 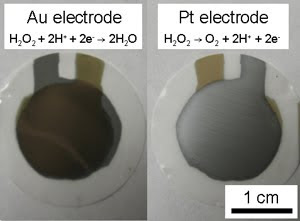 Hess and Jun sandwiched their membrane between gold and platinum electrodes. 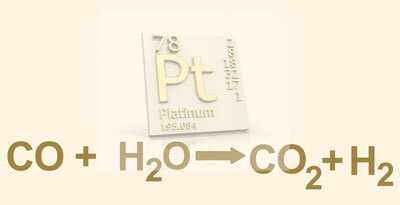 On the platinum side, hydrogen peroxide splits to form oxygen molecules, hydrogen ions and electrons. The electrons flow between the two electrodes, while the hydrogen ions are pumped through 1µm wide pores towards the gold electrode. Unlike in regular fuel cells, which use ion exchange membranes to keep the solutions surrounding cathode and anode from mixing, there is no need to create separate compartments. Instead, voltage is generated simply by immersing the electrode-coated membrane in hydrogen peroxide. The team is now working on getting the membranes to run on glucose, which would have the added advantage of making them biologically compatible, meaning they could eventually also be used in implants, for example to improve blood circulation. Optoelectronic tweezers are able to distinguish between live and dead sperm cells, even if they aren't moving, say US scientists. 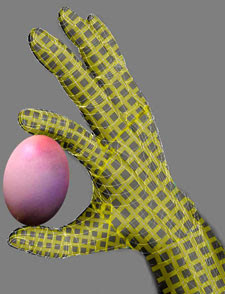 An important part of in vitro fertilisation (IVF) techniques is selecting and injecting an individual sperm cell into an egg. The quality of the chosen sperm is critical to the success of the procedure and is currently assessed by an operator looking at sperm movement under a microscope. 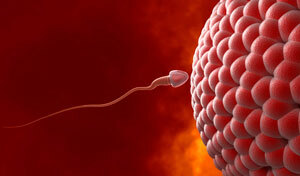 However, sperm that don't move are not necessarily dead, and it is nearly impossible to assess their viability visually. To combat this problem, Aaron Ohta at the University of Hawaii and his team have demonstrated that optoelectronic tweezers - which use a combination of light and electric fields to control microscopic objects - can distinguish and sort between live and dead cells, irrespective of mobility. Sperm cells are suspended in a low-conductivity salt solution, against which the inside of live cells have a higher ionic concentration. However, as the sperm die, their cell membranes become permeable and the internal ion concentrations become more similar to the solution. The researchers placed samples in a microfluidic chamber, that has indium tin oxide-coated glass on both the top and bottom sides with a 1 µm thick layer of amorphous silicon on the bottom. They then applied a current across the top and bottom, creating a uniform electric field within the chamber. When they shine light onto the amorphous silicon layer, they can make small regions more conductive. This electric field gradient then attracts live cells and repels dead ones, owing to their different ionic concentrations. 'This is something that could be easily implemented right away,' says Ketan Bhatt, an expert in dielectrophoresis at the CFD Research Corporation in Alabama, US. 'It shows a very clear separation between the sperm cells that are alive and those that are not,' he adds. 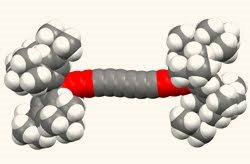 Researchers in Canada have synthesised the longest polyyne to date - a linear chain of carbon atoms. Polyynes can act as a model for an elusive one-dimensional form of carbon, carbyne, which is proposed to exist in dust found between stars but has so far proved impossible to prepare in a well-defined form in the laboratory. Given the remarkable range of properties of other allotropes of carbon, including diamond, graphite and fullerenes, chemists believe that carbyne could also have unusual and potentially useful characteristics, for example as molecular wires for nanoscale electronics. Wesley Chalifoux and Rik Tykwinski, of the University of Alberta in Edmonton, succeeded in making a polyyne consisting of 44 carbon atoms - the previous longest being 28 atoms. 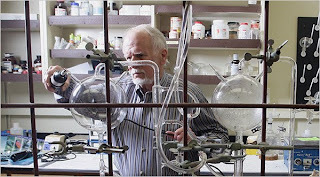 'Polyynes are difficult to make because if you try to purify them they usually decompose into a some amorphous black goo which falls to the bottom of the flask,' says Tykwinski, who is presently at the Friedrich Alexander University in Erlangen, Germany. To make polyynes, chains of acetylenic units are bolted together. Chalifoux and Tykwinski used an especially bulky end group - consisting of three linked aromatic rings, each containing three butyl groups - on one side of their acetylenic precursors. When two of these semi-protected acetylenes link together, both ends of the resulting polyyne chain possess the stabilising end caps, allowing the molecule to be purified and characterised. In this way, the researchers made a number of polyynes of differing length, with the longest containing 22 acetylene units, totalling 44 carbon atoms. 'We have shown how these longer chains can be made stable,' says Tykwinski. 'This should now allow us to start examining the properties of these one-dimensional carbon chains in more detail.' The researchers demonstrated that the polyyne - and thus presumably carbyne - has alternating single and triple bonds, something that was suspected but not verified until now. The most mysterious moment in a bubble’s life is when it pops and instantly loses its glorious form. Now researchers have used a high-speed camera to reveal what exactly happens when a hemispheric bubble, the kind that might sit on a soapy glass, bursts. A bubble may form a plethora of smaller bubbles when it pops, depending on its viscosity, or how thick and glutinous it is, according to a study published in the June 10 issue of the journal Nature. When a bubble bursts, its surface film folds back onto itself and traps a doughnut-shaped pocket of air, the researchers observed. Surface tension causes this ring to break, resulting in a set of small droplets — or daughter bubbles. This effect, as far as the scientists can tell, lasts for one more generation before it stops. The viscosity of the bubble is correlated to the daughter bubble effect, said James C. Bird, a post doctoral fellow at the Massachusetts Institute of Technology and the lead author of the study. A soap bubble, which has a low viscosity, generates daughter bubbles. But a bubble made from molasses or chocolate syrup does not. Q. HAVE YOU ALWAYS BEEN INTERESTED IN THE CHEMISTRY OF LIFE? A. No. When I started in graduate school in 1965, I had ideas about becoming a theoretical chemist, applying quantum mechanics to chemistry. But when I arrived at U.C.S.D., I met Stanley Miller, who’d been a student of Nobel Prize-winning chemist Harold Urey. In 1953, they completed the classic experiment on the chemical origins of life. They’d taken gases present on the early Earth like methane, ammonia and hydrogen and applied a spark discharge to them, to mimic lightning. From that, they produced amino acids, the compounds that make up the proteins in all living organisms. It was a stunning discovery. So when I met Stanley, I was hooked. I switched my thesis to work with him. My Ph.D. idea was to move the spark discharge experiment a step forward by studying amino acid stability. Q. WHY WAS STABILITY IMPORTANT TO UNDERSTAND? A. Because, in the turbulent environment of the early Earth, if an amino acid had been too unstable it would have decomposed. There would have never been enough of it to make up what we call “the prebiotic soup,” the molecular ingredients of life. So I suggested this one set of reactions that might constrain their decomposition, and then, in the lab, we did an experiment, which worked the first time we tried it. We were able to show some of the conditions that would allow amino acids to exist for longer time periods. And this allowed us to understand what types of amino acids may have been present on the baby Earth. Q. DO WE KNOW HOW THEY BECAME LIFE? A. We are closing in on that question. The Earth had to cool down enough for water to appear. Water allows molecules to dissolve and interact, which is why it is essential to life. We do know that we went from simple molecules to more complex molecules and eventually to RNA, which evolved into DNA. This took about a billion years. The missing piece of the puzzle is that intermediate phase between the amino acids and the RNA phase. We know that RNA is too complex to have arisen out of the simple molecules of the primordial soup. We can surmise that this intermediate form was able to make copies of itself to pass onto the next generation. Over time, mutations occurred and those mutants with survival advantages thrived and on and on until you eventually got to the complex RNA world. Q. IS THIS SAME PROCESS AT WORK SOMEWHERE IN THE UNIVERSE NOW? A. The chemistry we see in the lab is universal chemistry. It takes place anywhere you have the ingredients and conditions. We know that it happened, partially, on some of the meteorites that have come to earth. Amino acids have been found inside some of them. Q. SO WE’RE PROBABLY NOT ALONE? A. I don’t want to say “we” because people immediately think of something like a human being. But life as we know it — a self-replicating system — is probably not unique to the Earth. Under the right conditions, with the right chemistry, it can happen. There may be simple chemistry happening on Titan, a moon of Saturn. Some people think it could be happening on the satellites of Jupiter. There are compelling reasons to think that Mars was wet when it was young and that the raw materials for life could have been there. We don’t know how far it progressed. Q. DID YOU SUPPORT FORMER PRESIDENT GEORGE W. BUSH’S PLAN FOR MANNED TRAVEL TO MARS? A. I’m glad the Obama administration appears to be canceling it. Until we know whether or not life existed on Mars, putting humans there is premature. We’d contaminate the planet. All we’d see is human microbes and refuse. Q. ON THE OTHER HAND, STEPHEN HAWKING THINKS EXPOSURE TO EXTRATERRESTRIAL LIFE COULD PROVE HAZARDOUS TO EARTHLINGS. “IF ALIENS VISIT US, THE OUTCOME WOULD BE MUCH AS WHEN COLUMBUS LANDED IN AMERICA, WHICH DIDN’T TURN OUT WELL FOR THE NATIVE AMERICANS,” DR. HAWKING RECENTLY WARNED. IS HE ONTO SOMETHING? A. Dr. Hawking suggests an intriguing possibility, although there are alternative scenarios. Aliens might bring some exotic organisms with them to Earth, but would they survive in our oxygen-rich environment long enough to do any damage to humans or the ecosystem? Meteorites from Mars have landed on Earth throughout history, and if any Martian organisms were hitchhiking on these, they have not killed us yet. Q. THREE YEARS AGO, YOU REDID THE SPARK DISCHARGE EXPERIMENT. WHY? And there it was! Inside, were all these tiny glass vials carefully labeled, with page numbers referring Stanley’s laboratory notes. I was dumbstruck. We were looking at history. It immediately hit me that when Stanley had first done the experiment, analytic tools were still very, very primitive. We have instruments today that are a billion times better. So we then reanalyzed the original materials with the modern tools. And lo and behold, we found that the spark discharge experiment had actually made about 30 compounds. Stanley had shown they’d made only five! Q. DID YOUR ANALYSIS CONFIRM THE VALIDITY OF THE EXPERIMENT? THERE ARE SOME PEOPLE WHO STILL DOUBT IT. A. Oh, yes. And more! It showed how easy it was to make a huge number of compounds. What was really interesting was the Murchison meteorite, which fell to earth in 1969, was originally thought to contain maybe 75 amino acids. Three years ago, when we compared the distribution of amino acids in the discharge experiment, they were uncannily similar to those in the meteorite. Q. DO YOU THINK IT WOULD BE VALUABLE FOR OTHER SCIENTISTS TO REVISIT OLDER EXPERIMENTS? A. Listen, I was very fortunate to have had a mentor who had the foresight to preserve his experimental materials. Nonetheless, he couldn’t anticipate all the changes that came with modern analytical chemistry. Today, we are seeing an explosion of knowledge due to new techniques. We ought to use them. There was just an article in the journal PNAS about how new methods further characterized the compounds in Murchison. Up to now, we knew of hundreds in it. Yet, because of new techniques, they’ve found tens of thousands. And that made me think that yes, we ought to redo the spark discharge experiment. I suspect we’d also find tens of thousands of molecules that were in the prebiotic soup. That, hopefully, is the next project we’ll be pursuing. Blue is sometimes not an easy color to make. 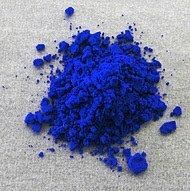 Blue pigments of the past have often been expensive (ultramarine blue was made from the gemstone lapis lazuli, ground up), poisonous (cobalt blue is a possible carcinogen and Prussian blue, another well-known pigment, can leach cyanide) or apt to fade (many of the organic ones fall apart when exposed to acid or heat). So it was a pleasant surprise to chemists at Oregon State University when they created a new, durable and brilliantly blue pigment by accident. The researchers were trying to make compounds with novel electronic properties, mixing manganese oxide, which is black, with other chemicals and heating them to high temperatures. Then Mas Subramanian, a professor of material sciences, noticed that one of the samples that a graduate student had just taken out of the furnace was blue. “I was shocked, actually,” Dr. Subramanian said. In the intense heat, almost 2,000 degrees Fahrenheit, the ingredients formed a crystal structure in which the manganese ions absorbed red and green wavelengths of light and reflected only blue. When cooled, the manganese-containing oxide remained in this alternate structure. The other ingredients — white yttrium oxide and pale yellow indium oxide — are also required to stabilize the blue crystal. When one was left out, no blue color appeared. The pigments have proven safe and durable, Dr. Subramanian said, although not cheap because of the cost of the indium. The researchers are trying to replace the indium oxide with cheaper oxides like aluminum oxide, which possesses similar properties. WHAT do garlic and onions have in common with gunpowder? A lot. They’re incendiary. They can do harm and they delight. Sulfur is central to their powers. And they helped inspire the work of a chemist who has just published a welcome treatise on the smelly yet indispensable allium family. Eric Block became hooked on chemistry by way of basement and driveway pyrotechnics while growing up in Forest Hills, Queens. By high school he had become the science nerd while his schoolmates Paul Simon and Art Garfunkel were the epitome of cool. 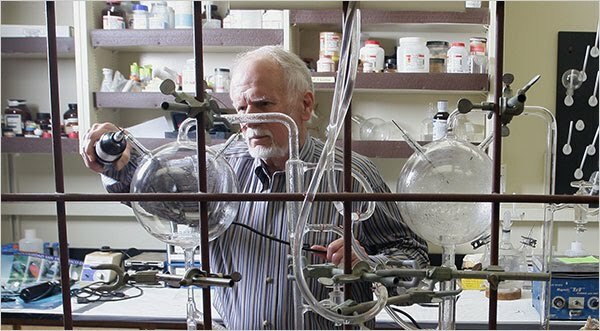 He found his calling in allium chemistry as a new Ph.D., and over four decades has worked out many of its details at the State University at Albany. Dr. Block’s book “Garlic and Other Alliums: The Lore and the Science” was published earlier this year by the Royal Society of Chemistry. The chemical details are tough for a nonspecialist to follow, but much of the text is in happily clear English. It includes a wide range of cultural references and beautifully reproduced images, among them excerpts from Sumerian cuneiform tablets and “Dracula” and pictures of the firework-like flower heads of ornamental alliums, the onion domes of Russian churches and Antonio Gaudí’s garlic-topped Barcelona apartment house. Most helpfully for the cook, he sorts out the different kinds of allium flavors and how they evolve on the cutting board and stove. And he gives an intriguing preview of new alliums just over the horizon. Their sulfur-based defense systems give the alliums their distinctive flavors. The plants deploy them when their tissues are breached by biting, crushing or cutting. The chemicals are highly irritating, and discourage most creatures from coming back for seconds. They kill microbes and repel insects, and they damage the red blood cells of dogs and cats. Never feed a pet onions or garlic in any form. Any cook knows that chopping alliums releases chemicals that sting. Garlic can get into the eyes and mouth even if a clove is just rubbed on the foot, a body length away. Its active ingredient passes right through the skin and into the blood. Prolonged contact with garlic will blister and burn the skin, as some of the book’s less pleasant photos document. Dr. Block explains that different alliums stockpile different sulfur chemicals to make their weapons, and this accounts for their varying flavors. The stockpiles themselves are inert, but when the plant’s tissues are damaged, enzymes in the tissues quickly convert the sulfur compounds into reactive, stinging molecules. Garlic cloves produce a chemical called allicin, which is responsible for their strong pungency and aroma. It’s a relatively large molecule and acts mainly on direct contact with the eater, the plant world’s version of hand-to-hand combat. The flat-leafed allium known as Chinese or garlic chives produces a small amount of garlicky allicin, but much more of a different weapon that has a milder, cabbage-like aroma. 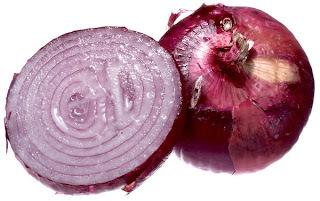 Onions, shallots, scallions and leeks share a special stockpiled chemical and a second defensive enzyme. They produce a sulfur molecule that’s small and light enough to launch itself from the damaged tissue, fly through the air and attack our eyes and nasal passages. This long-distance weapon is called the lachrymatory factor because it makes people’s eyes water. Other familiar alliums, like elephant garlic, ordinary chives, wild ramps and ramson, generate variable mixtures of the garlic, Chinese chive and onion weapons, and have a blend of their flavors. The same reactivity that makes the allium sulfur compounds such potent weapons also makes them short-lived. They immediately begin to react with other molecules in the plant tissue and gradually generate a flavor that is less pungent but also less fresh-smelling, more harshly sulfurous. The heat of cooking speeds these and other reactions, largely eliminates the pungency, and allows the sweetness of the alliums to emerge and blend with the sulfurous aromas. Heat also knocks out the tissue enzymes, so they can’t produce any more pungency. This basic chemistry leads to some general guidelines for cooking. If you’re using onions or garlic or chives raw, in a dressing or salsa, either chop them just before serving or rinse the chopped pieces thoroughly. Water removes the harsh aging sulfur compounds from the cut surfaces, so you’ll taste only the fresh ones. If you’re heating garlic or onions or their relatives, then cooking whole or coarsely chopped bulbs will moderate their flavor. Crushing or grating will intensify it. Crushing can also diversify the flavors that alliums contribute to cooked dishes. They’re valuable ingredients in part because their sulfur chemistry suggests and reinforces savory meat flavors. Last year a German study of meat stews found that by far the strongest contributor to the overall “gravy” aroma was an unusual sulfur compound that came not from the meat, but from the onions and leeks. And that compound appears only after these vegetables have been cut up. So if you’re counting on alliums to give depth to stews or braises or stocks, then chop them finely or crush or purée them. Heat will eliminate the bite and develop the aroma. Dr. Block’s book may be the definitive word on the alliums for the moment, but as it and he make clear, there are new flavors to look forward to. Researchers in New Zealand and Japan recently developed an experimental onion that lacks the lachrymatory-factor enzyme. So it’s tear-free, but unlike very mild onions like Vidalias, it still has its full stockpile of sulfur materials. It ends up boosting the levels of trace compounds that Dr. Block discovered and named zwiebelanes. He describes them as having “a wonderful, fresh, sweet onion aroma.” So this tear-free onion promises to be intensely oniony, but in a new way. Dr. Block and some of his colleagues are also beginning to study the several hundred allium species that still grow wild in Central and Southwest Asia, a number of which are harvested locally and eaten in large amounts, and have very different defensive chemistries. “I want to see what other surprises nature has in store for us,” he said. International agreements on intellectual property (IP) threaten the flow of generic HIV drugs from India to developing countries, according to a new report. 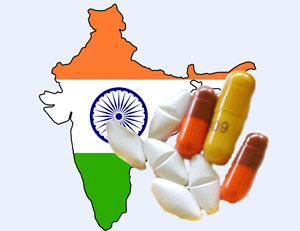 India has established itself as the 'pharmacy of the developing world', and since 2006, generic manufacturers in the country have accounted for 80 per cent of the antiretroviral (ARV) drugs bought by developing countries with money from donor organisations, report researchers from Boston University and Harvard Kennedy School of Government in the US and Unitaid, an international organisation that aims to increase access to cheap drugs for developing world problems. But according to the report, the World Trade Organization Agreement on Trade Related Aspects of Intellectual Property Rights (Trips), which India was obliged to accept in 2005, is harming supply: 'The introduction of product patents in India is severely constraining the generic competition and supply, particularly for newer medicines,' the authors say. Furthermore, free trade agreements currently under negotiation, including those between the EU and India, contain 'measures that could delay or restrict competition from generic medicines'. Between 2003 and 2008, the number of Indian companies making generic ARV drugs increased from four to 10, while the number of ARV products has risen from 14 to 53, the authors report. In addition, generic ARV drugs made in India are 'consistently and considerably' cheaper than equivalents from other regions. 'Rather than agreeing to inappropriate IP obligations through free trade agreements, India and its trade partners should ensure that there is sufficient policy space for Indian pharmaceutical manufacturers to continue their central role in supplying developing countries with low-priced, quality-assured, generic medicines,' the report concludes. Stronger IP arrangements could encourage investment in developing world problems by multinational companies, says Daniele Archibugi, an expert in the economics and policy of technological change based at Birkbeck College, University of London, UK. But in general, such agreements are not in the interests of developing countries as they can drive up the price of goods. According to Archibugi, developing countries did not negotiate enough compensation when they signed up to the Trips agreement. He says they could seek to rebalance the deal by deferring for as long as possible enforcement of the regulations, which would occur at a national level. In addition, he advocates public financing of vaccine research. Legal protection is particularly significant in the drug industry, where 'imitation costs' are very low, he adds. But report co-author Suerie Moon, from the Harvard Kennedy School of Government, says patent protection is not enough to drive R&D for developing world problems. In poor regions, the resulting higher prices simply mean patients will not buy the drugs they need. The drug industry makes most of its money in wealthy countries, she adds. Could 2010 yet be the year of the obesity drug? At first glance the signs are promising. Regulators in the US will soon decide whether to allow three new contenders onto this attractive market. Two of those have been the subjects of marketing deals in the last few months. But yesterday Lorqess (lorcaserin), developed by Arena Pharmaceuticals, failed to get a recommendation from a highly-influential US Food and Drug Administration (FDA) advisory committee. It joins Qnexa (phentermine-topiramate), developed by Vivus, which the same committee voted against in July. Only Contrave (naltrexone-bupropion) still faces the panel. But despite such safety concerns, interest in new obesity drugs seems at a high. Earlier this month, Takeda agreed to pay $50 million (£32 million) upfront for marketing rights to Contrave. The deal includes payments of over $1 billion if regulatory and sales milestones are met and - following commercialisation - double-digit royalties on net sales. It gives Takeda exclusive rights in the US, Canada and Mexico. Orexigen will retain the right to co-promote Contrave in the United States. The Takeda move came hard on the heals of a marketing and supply deal between Eisai and Arena for Lorqess, which had some remarkably similar features. Eisai agreed to pay $50 million upfront, gaining exclusive US rights to commercialise the drug. The firm is also due to pay up to a further $90 million to Arena in milestone payments when the drug makes it through regulatory approval - a goal that perhaps appears more distant following the FDA advisory committee recommendation. The pharmaceutical industry has endured a traumatic relationship with the obesity market. The notorious 'fen-phen' case led Wyeth (then American Home Products, now part of Pfizer) to set aside a staggering $21 billion to resolve litigations. The fenfluramine-phentermine anti-obesity combination was pulled in 1997 following reports of heart valve disease. Fen-phen was by no mean the only failure - a string of candidates from a number of companies have been dropped early or flopped at regulatory hurdles since then. Despite the lack of success, it is the potential payoff that maintains interest in the obesity market. Globally, more than 1.5 billion adults are overweight and at least 400 million are obese. By 2015, the World Health Organization predicts that 2.3 billion people will be overweight and more than 700 million obese. Meanwhile, the number and severity of the known health risks associated with obesity are increasing. 'This market has tremendous growth opportunity,' says Ranjith Gopinathan, an industry analyst at market research company Frost and Sullivan. The European market alone was $718 million in 2009, he adds. Given an estimated 8 per cent growth per year, Gopinathan predicts this will rise to over $1 billion by 2014. But realising the dream is unlikely to be straightforward says Jonathan Angell, a healthcare analyst at market research firm Datamonitor: 'The question you have to ask yourself is, if there's this fantastic market potential, why are we sitting on a market value that was about $500 million in 2008?' Based on a few reasonable assumptions, he says, in the seven major countries (the US, UK, Germany, Spain, France, Italy and Japan) you might estimate the market potential to be over $9 billion, rising to over $12 billion by 2018. According to Angell, the pharmaceutical industry has focused on a 'mass market' approach that has burdened it with huge safety expectations. Drugs intended for such widespread - and long-term - use must be 'whiter than white' to gain approval. This problem has been exacerbated by the negligible risk associated with what is for most obese people the first-line treatment: improved diet and more exercise. Companies might do better if they could target the patients needing surgery to reduce their weight Angell adds, something genomics may soon allow. 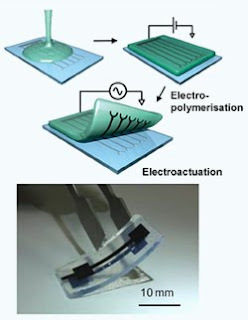 Flexible, organic, moist electrodes have been designed by chemists in Japan. Composed of conductive polymers patterned onto slices of hydrogel, the biocompatible electrodes can function under wet conditions for up to a month - making them very useful in medical research. Producing cheap and effective electrodes that work inside biological systems is crucial for designing implantable medical devices or monitoring the activity of cells in the body. Conductive polymers, such as PEDOT - poly(3,4-ethylenedioxythiophene) - have great potential for this application, but until now have been difficult to mount onto suitable substrates. Conductive polymers are usually printed or stamped onto surfaces using a liquid polymer 'ink' which needs to dry, a process which does can't be used with moist surfaces like hydrogels. To solve this problem, Matsuhiko Nishizawa and colleagues at Tohoku University developed a novel two-step system that uses electropolymerisation. © J. Am. Chem. Soc. In this process, a platinum master electrode is made and liquid agarose gel is poured and set on top at a thickness of 2mm. A potential is then applied across the system, within an aqueous solution of the PEDOT monomer. This results in a thin layer of PEDOT forming on the hydrogel at the point of contact with the platinum master. A further challenge that the team needed to overcome was peeling the hydrogel tablet away from the platinum without damaging it. To do this, Nishizawa made use of the natural electrochemical behaviour of PEDOT. By reversibly reducing and oxidising the PEDOT, it can be made to contract and expand - causing the hydrogel tablet to curl up and peel itself away from the platinum plate. With repeated cycles, the tablet can be completely removed. The team believes that this general strategy can be used to make more complicated patterns and also etch on other gels, such as collagen or fibrin. One example where they envisage the research being useful is to provide direct electrical stimulation to muscle tissue, such as in the heart. US researchers have developed a nanotechnology-based test to detect the important vitamin D metabolite calcitriol, the deficiency of which is an indicator of kidney failure. We all get vitamin D from our diet and from our exposure to sunlight. Vitamin D and its metabolites have an important role in our body's health as they regulate calcium and phosphate levels. Excesses and deficiencies have recently been linked to cardiovascular disease, cancer and kidney disease. Because of this, clinical demand for an easy test for calcitriol has increased significantly. Most of the current methods use immunoassays that require radio- or enzyme-labels that need large amounts of serum sample and produce radioactive waste and can be very complex which limits their use. Now Marc Porter and colleagues at the University of Utah in Salt Lake City have developed a test based on using surface enhanced Raman scattering (SERS) combined with gold nanoparticles. This new technique requires a much smaller sample volume and has no radioactive waste. 'Our work demonstrates that a simple optical method, when combined with gold nanoparticle labels, can outperform the standard methods heavily used in clinical diagnostic laboratories around the world,' says Porter. The combination of SERS with an extrinsic Raman label (ERL), in this case modified gold nanoparticles, has produced a competitive assay with a limit of detection of 8.4 pg/mL - matching the sensitivity of previous immunoassay methods. 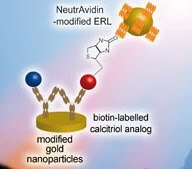 Following exposure to calcitriol, a biotin-labelled analog can be bound to unoccupied antibody sites allowing subsequent ERL binding to complete the assay and the observed response decreases when the concentration of calcitriol increases. New ways of incorporating pressure sensors into large, flexible surfaces which could one day provide robots or people fitted with artificial hands with a delicate sense of touch, have been developed by three independent teams of US researchers. Sensitive and rapid detection of pressure has long been a goal for researchers working with robotics and, in the more distant future, for prosthetic hands where a touch-sensitive mechanical skin would be integrated into the wearer's nervous system. At Stanford University, California, Zhenan Bao's team has developed what is in effect a flexible, pressure sensitive capacitor.1 It consists of the highly elastic polymer polydimethylsiloxane (PDMS) sandwiched between flexible electrodes incorporating organic semiconductor transistors. The polymer is moulded so that its base consists of multiple, micrometre-scale pillars. As pressure is applied on the surface of the construct, the polymer pillars are compressed, reducing the distance between the electrodes and altering the capacitance of the system, whose position and magnitude is detectable by the semiconductors. 'Using this system we can easily fabricate arrayed structures with pressure sensing capability over a large area,' says Bao. Meanwhile in a different department at the same university, Giulia Lanzara and her colleagues have focused on the problem of creating precision microcircuitry over a large area.2 Micro- or even nanoscale electronics can be fabricated relatively simply in a small area through techniques such as photolithography. Scaling this up, however, requires components to be manually positioned, which is costly and logistically tricky. Lanzara's team has found a way of making a compacted, parcelled up small circuit and effectively unfolding it into a large circuit of predetermined geometry. To demonstrate the approach, the researchers used conventional microcircuitry methods to deposit platinum spots on a thin film of the flexible polymer polyimide. These spots are then connected by thin gold wires. But instead of being laid down in a straight line, the wires are looped back and forth resembling a folded ribbon. Multiple spots - nodes - and wires can be patterned in this way. 'We then use an etching mask and remove all the excess polymer substrate from surface, leaving only the wires and nodes,' says Lanzara. The circuit can now be expanded - with the folded wires able to simply extend like a concertina to up to 16 times their original length. The platinum nodes can be fabricated to act as resistors that are sensitive to pressure, while the gold wires are sensitive to changes in temperature. In this way the expanded circuit can detect changes in pressure and temperature. 'We can fabricate the initial circuit so that it can be extended to form the final shape of circuit we require, in two or three dimensions and with different densities of component on the circuit, so that on an artificial hand, for example we could have a greater density of sensor nodes at the fingertips,' says Lanzara. The team printed the nanowires onto a 7cm2 matrix containing nearly 350 pixels. 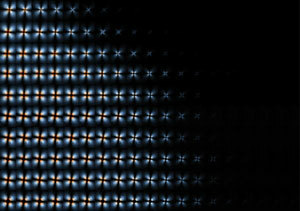 Each pixel contained a transistor consisting of hundreds of the semiconductor nanowires. A silicone-based pressure-sensitive rubber was integrated with the circuit. The rubber's electrical resistance changes when pressure is applied to it, and this is detected by the semiconductor array. Fredrik Sebelius, of Lund University in Sweden, is interested in the development of technologies relating to an artificial hand. Commenting on the new research, Sebelius says that while the underlying technologies used in all three cases have been around for some time 'these are new sensors that probably work better and in some case can be made really low cost'. 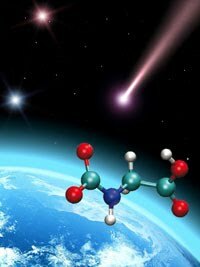 The shock waves caused as comets hit the early Earth could have helped promote the formation of amino acids and the early building blocks of life, say US researchers. It is thought that amino acids and short peptides played a significant role in the chemical evolution that resulted in life on Earth, but researchers have historically disagreed on how these chemicals got here in the first place. Researchers at the Lawrence Livermore National Laboratory and Stanford University have now run theoretical simulations of shock compressions that mimic the conditions created when a comet hits the Earth, which suggest that the ingredients for life on Earth could have been delivered from space. Comets are made of dust, ice and compressed gases. The ice is predominantly water, but is also known to contain small molecules that promote bacterial growth - prebiotic molecules - such as carbon dioxide, ammonia and methanol. Nir Goldman and colleagues studied molecular dynamics simulations of shock waves after a comet strike to see if the prebiotic ingredients for life could survive the conditions during and after impact. Initially the team thought the conditions after a direct comet strike would be too intense for the compounds to endure, but they then considered comets that might have struck the Earth from a gentler angle. 'That would mean that the comet impact would produce much lower temperatures and pressures and maybe these would be low enough that something like an amino acid might survive if it was formed,' Goldman told Chemistry World. The team also found that the shock waves from a comet's impact can promote short-lived C-N bonded oligomers, and that when the pressure dropped after impact, these oligomers break up to form stable complexes containing the amino acid glycine. 'The computational studies provide some compelling evidence for complex organic chemistry under conditions of extreme pressure and temperature such as those expected during oblique impact of a short-period comet with the early Earth,' says Terence Kee, an astrobiology expert at the University of Leeds, UK. 'They demonstrate that small organic polymers are produced under high pressure and temperature which subsequently break down to form important molecules such as glycine and possibly higher oligomeric peptides,' he adds. Goldman now hopes to study the molecular simulations on much longer timescales to see if they help explain more about prebiotic life on Earth. 'Longer timescale simulations, both of the shock compression and the release after the shock compression, could reveal mechanisms for much more complicated amino acids,' he says. UK researchers have observed a phenomenon called the isotope effect in a single molecule trapped within a membrane-based 'nanoreactor'. The isotope effect - where the rate of a reaction is altered depending on the presence of a given isotopic atom in the reactant - is a key tool for elucidating reaction mechanisms, and the new finding could open up powerful new ways to study chemical reactions. Hagan Bayley's team at the University of Oxford has previously shown how a nanoreactor can be created by assembling proteins within a lipid bilayer to form a nanoscale pore through which ions can flow, creating a measurable ionic current. Molecules can be trapped and reacted within the pore and the changing identity of molecular species within the pore is mirrored by changes in the ion current, which can be measured at sub-millisecond timescales. In the latest experiment, the researchers created a nanopore with a thiol group protruding into the space within the pore. A quinone molecule was then introduced, which reacts with the thiol to form first an intermediate, followed by a product. This gives two distinct ion current signals. If the experiment is repeated with a deuterium atom in the place of a key hydrogen on the quinone ring, conversion of the product occurs significantly more slowly because the reaction requires the breaking of the C-H (or C-D) bond - this is the isotope effect. Importantly, because the technique follows sequentially the formation of intermediates and products, the isotope effect is visible in any step. In bulk, or ensemble, experiments the isotope effect is only noticeable if it occurs at the rate-limiting step of the reaction. By being able to detect the breaking of isotope-containing bonds at points in the reaction that are not rate limiting, the technique could become a powerful new tool for extending isotope effect studies.